…aren’t they just! JD doesn’t like our parent facing pram and demonstrated this by trying to jump out on a zebra crossing, my poor nerves were shot to pieces! I need to get a pushchair urgently so she can see more! It doesn’t help that she’s so big that people look in the pram expecting to see a newborn and cheeky girl pops her face out and raspberries them! 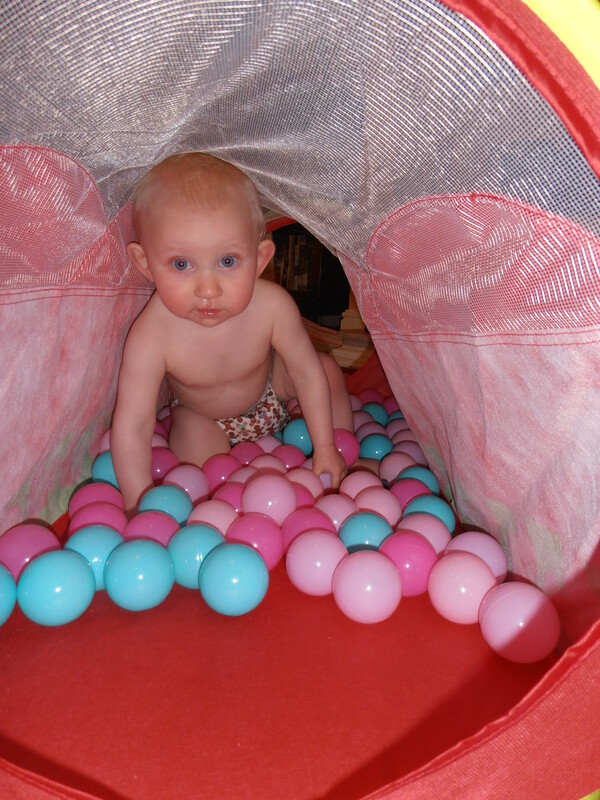 In order to tame her at home we invested the princely sum of £10 in a popup tunnel and 100 balls, hours of fun for her, ours of clean up chasing small balls out from under the sofa for me and daddy! I thought I’d update on work life today, I’ve a 6 month contract extention which is a huge relief and actually working life is going well despite my worries! Its brought a nice balance actually, toddlers and quite trying some days and it’s good to use my brain for something a bit different too, makes for a better rounded mama and I have a bit more energy for chasing her round too! Still the toothless wonder at 14m, will this be the month we get a first tooth? I’m launching a giveaway later this week in my role as a Munchkin Mummy reviewer, see you then! Ha! how adorable is this wee bird! Nothing more fun than a pop up tent with 100 balls to play with! Fab! I cannot wait until my Miss Belle is crawling to do this! You’re so right about them being into everything – and it just gets worse! I regularly find my three year old about to cause havoc on something – it’s when they go mysteriously quiet you know they’re up to trouble! Adorable! I don’t think I could be bothered constantly running after those balls! Happy to hear about your extension too. Love the photo! S has a ball pit and her favourite game is to sit in it and kick all the balls out, and watch me picking them up to throw back in. If I’m not paying her enough attention she’ll sit in the pool and casually start throwing them out one by one until I join in the game! I found the same with returning to work – it made the time we spend together more precious! They do get into everything at this stage. The good thing is that most of the time they are obvious about it. My daughters are now either very sneaky or wanting to know about everything I’m doing! Beautiful little lady who looks like shes enjoying her pop up tent loads.